Seco Larm has introduced a brand new product in their Enforcer line of home security and automation products. 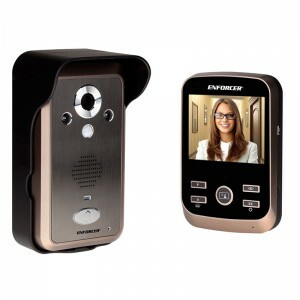 The DP236-Q is a wireless video intercom system designed for use as a doorbell intercom system. The system has a wireless range of nearly 500 feet, so even indoors users will be able to receive door calls from anywhere in their home. The system is perfect for home owners, care takers and store owners. Never miss a customer or courier again with this video intercom system. Also for people with limited mobility the monitor/receiver unit allows users to remotely activate relay(s) on the doorbell camera making it possible to remotely lock or unlock doors or gates. The outdoor camera piece is completely weather proof and has a built in tamper switch which will instantly trigger the receiver inside if someone removes the doorbell from its’ base.